Are you ready for another challenge?! 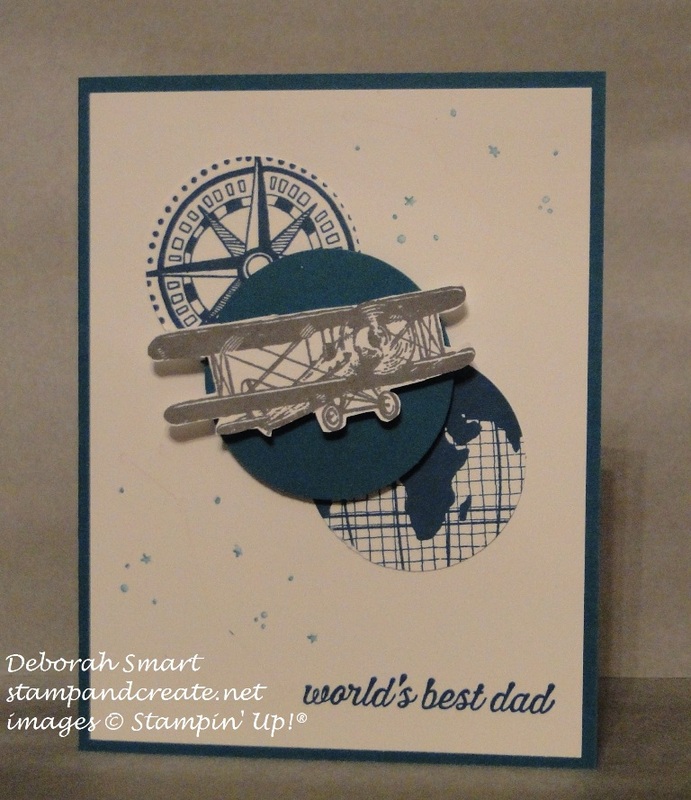 This week, Kath has a great Clean and Simple (CAS) challenge, with a masculine theme. I was initially going to use my Traveler stamp set, but then I remembered that I had loaned it to a friend, so I decided to use the retired SAB set Sky is the Limit. I started by stamping the globe and compass images from the retiring Going Global stamp set in Island Indigo ink onto Whisper White cardstock. I then used the 1 3/4″ Circle Punch to cut them out (a little smaller than the actual image size, but that’s what I wanted). I then punched out the same size circle from Island Indigo cardstock. The plane from Sky is the Limit was stamped in Archival Gray ink onto Whisper White; I used my snips to cut it out. I took a panel of Whisper White cardstock, and stamped the little stars from the Big Dipper image in Going Global; I used my Stampin’ Write Island Indigo Marker, as I just wanted the stars, not the whole constellation. I then glued the two stamped circles onto the panel using Tombow multipurpose glue, then added the Island Indigo circle using Stampin’ Dimensionals. I then added the plane over the Island Indigo circle, again using Dimensionals, then stamped the sentiment in the bottom corner in Island Indigo ink. The front panel was then glued to the Island Indigo cardstock base, for a nice quick, easy, clean & simple card! I hope you’ll check out what the rest of the design team has created for your inspiration, at the Watercooler Wednesday page. Then, create your own card, and link it up for the challenge! I hope you will; after all, Father’s Day is coming up soon, and there’s always birthdays you need cards for – you may as well have them ready! Thanks for spending some time with me today – until next time, happy stamping! Next Next post: Kick-Off Party Fun! Deborah I’m in love with your masculine CAS card! I wish the Sky’s the Limit stamp was continuing in our collection as it’s one of my faves and a real go to set for masculine themes. The three circles and imagery you chose from the other set is simply perfect with the bi-plane. Thanks so much for sharing!